Hey girls are you getting any rose for your love on Valentine’s Day? I have something more precious than rose, something that can light up my life and transformed my room into garden of roses… rosamundi! Known as the Queen of flowers, the rose takes pride of place at diptyque. The Greeks associated Aphrodite with the rose, the Romans Venus, Cleopatra used it to seduce Caesar and Mark-Antony... throughout the centuries it has acquired many symbolisms but the one that has lasted is pure, unalterable love. 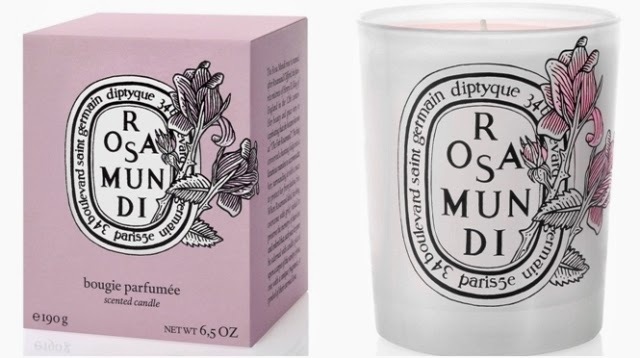 A new limited edition of the Diptyque Rosa Mundi Candle for Valentines. The ancestor of many ancient roses, including Centifolia, the Rosa gallica versicolor, or Rosa Mundi, gets its name from Rosamund Clifford, the mistress of the English King Henry II. The legend has it that to protect her from attackers, the King planted a labyrinth of rose bushes around the hunting pavilion where she was hidden. However his plan failed, and she was poisoned by the Queen. Every year, the King placed sumptuous roses on her grave. The very image of perfection, the rose is intimately linked to our senses and feelings. The Romantics saw the rose, in particular the pink rose, as a symbol of tenderness. Flowers and their colours have a language known only to the poets, which diptyque has expressed in its own way. Two legendary roses are its allies. Firstly, the Damask rose, which is harvested in May, over a three-week period, in the region of Isparta in Turkey, at over 1,000 meters in altitude. Secondly, the Centifolia or Rose de Mai. Grown in Grasse since the 16th century, and christened the rose with a hundred petals by Linné, it owes its name to its abundance of petals. Both roses are picked when they have just bloomed, in the early hours of the day, and are among the most noble ingredients used in perfumery. However, they do not easily give up their natural fragrance. To get a perfume bottle to exhale the scents of a flowering rosebush is a delicate process. As in many areas of life, perfect simplicity requires patience, research, respect and expertise.